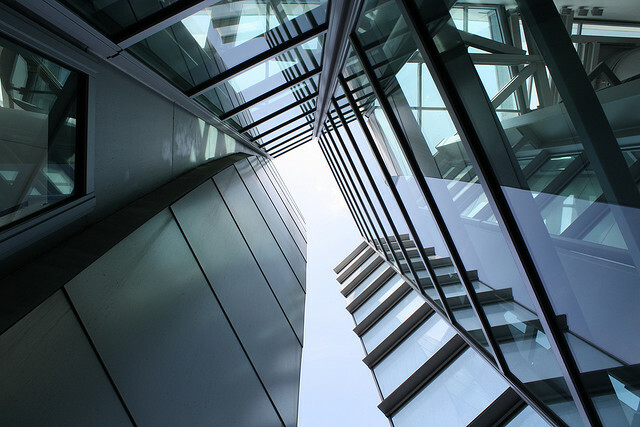 ... the other day prompted me to take a more detailed look; I discovered just what a stunning building it really is and I decided it just had to be the subject of my next article. 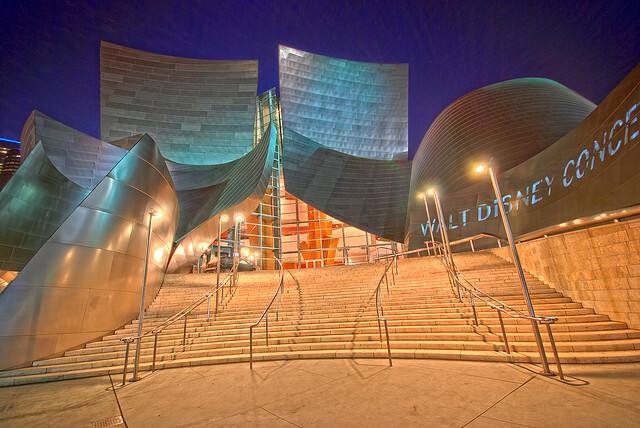 The Walt Disney Concert Hall is one of the venues on the campus of the Music Center, Performing Arts Center of Los Angeles County and is home to the Los Angeles Philharmonic Orchestra. 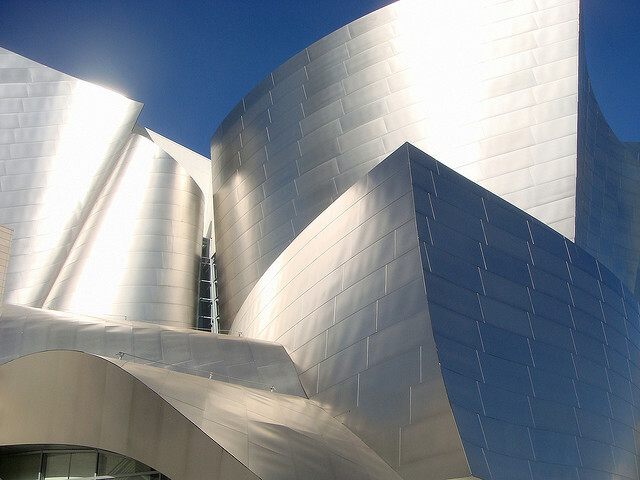 Construction of the Walt Disney Concert Hall was not without its problems. 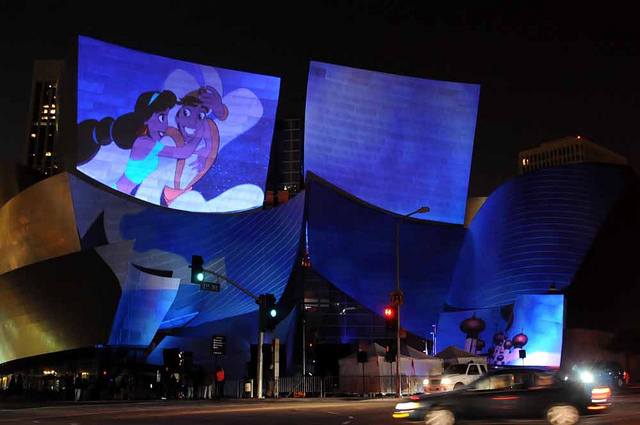 The project was initiated in the early 1990's with a donation of $50M from Lillian Disney, widow of Walt Disney. 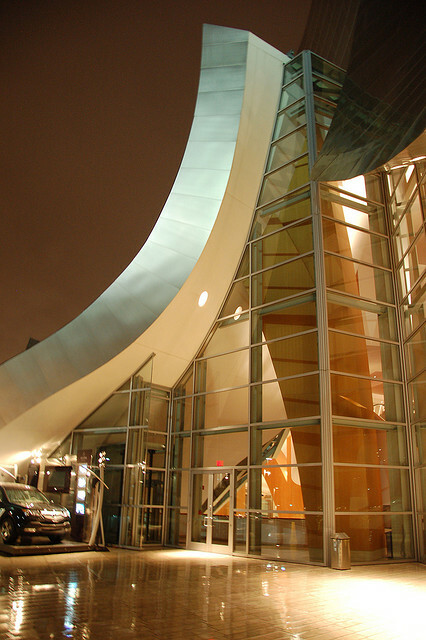 1992 to 1996 saw the construction of the underground garage at a cost of some $110M. 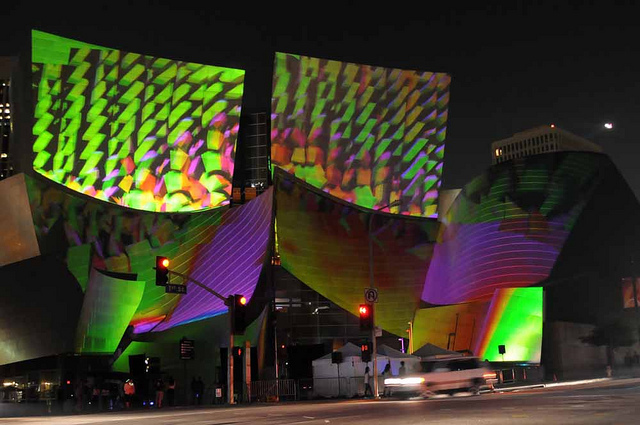 The garage construction was paid for by Los Angeles County bonds and the county suffered through some financial problems as a result of delays in construction of the hall itself; the county had planned on the use of parking revenue to repay debts related to construction of the garage. 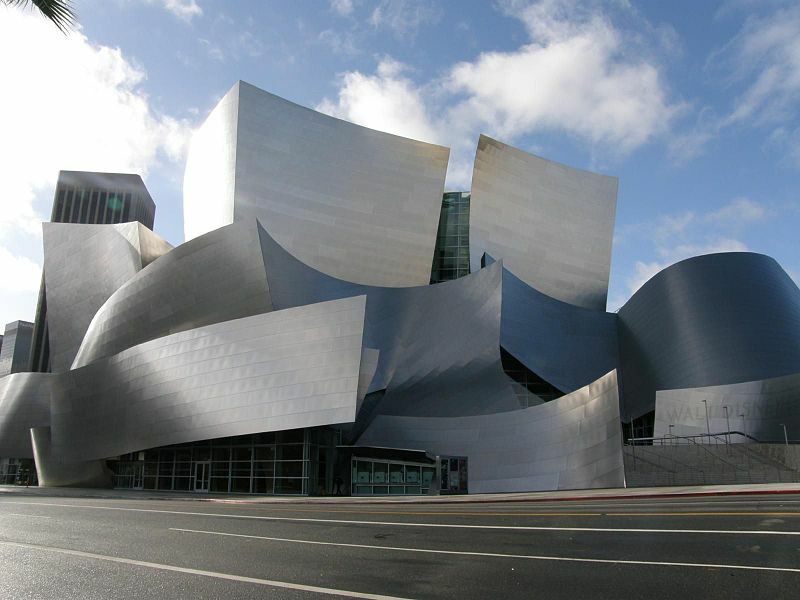 Fundraising continued through most of the 1990's; construction cost estimates skyrocketed and eventually plans for stone cladding on the building gave way to plans for cheaper metal cladding [though forced on the project that decision is ultimately what gave rise to the building being the magnificent structure it is today] and groundbreaking for the building eventually took place in 1999. 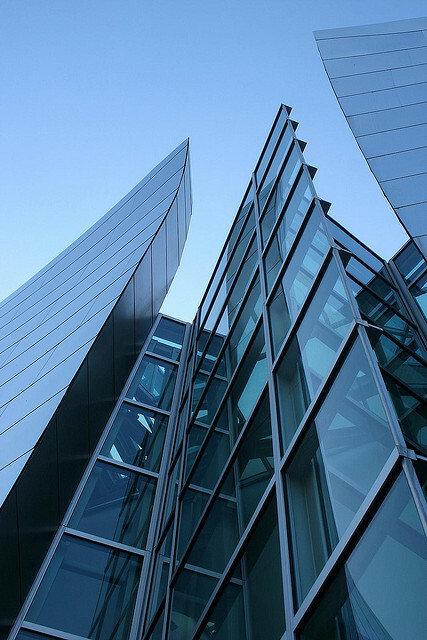 The project was completed in 2003 at a total cost of around $274M. 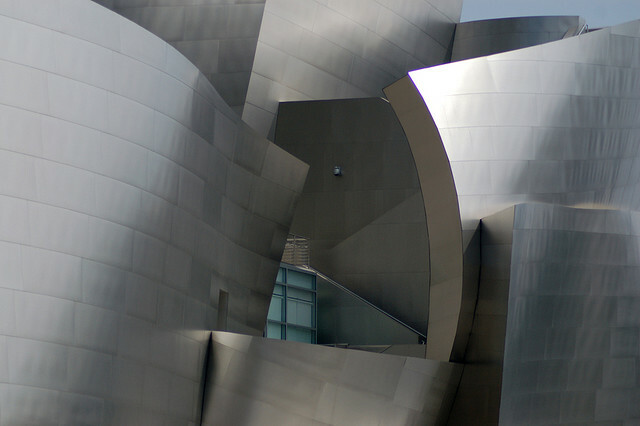 As with many of Gehry's creations the Walt Disney Concert Hall features curves a plenty and something of a lack of straight lines and perpendicular walls and that added a layer of complexity to the construction process. 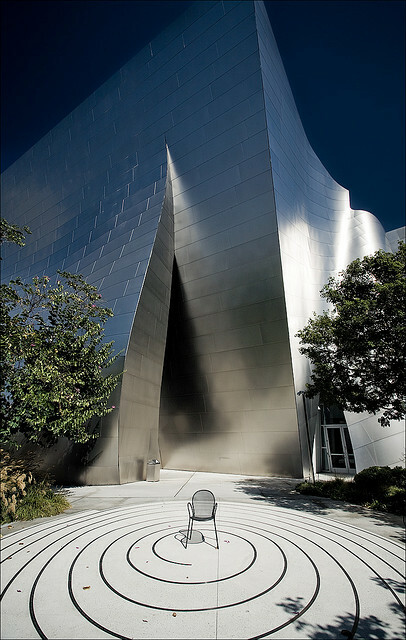 Builders Exchange Magazine carries the following quote from "Gehry's goto guy" Terry Bell, a project architect for Gehry Partners LLP. 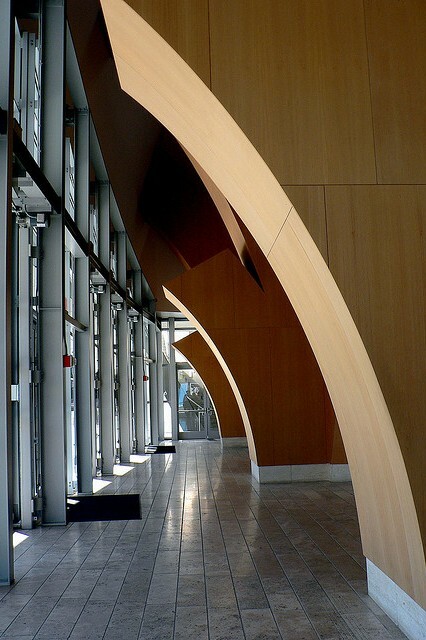 "The lack of right angles and the overall sculptural quality make the hall the most challenging of all Frank's buildings ... Everything about the anatomy is unusual. 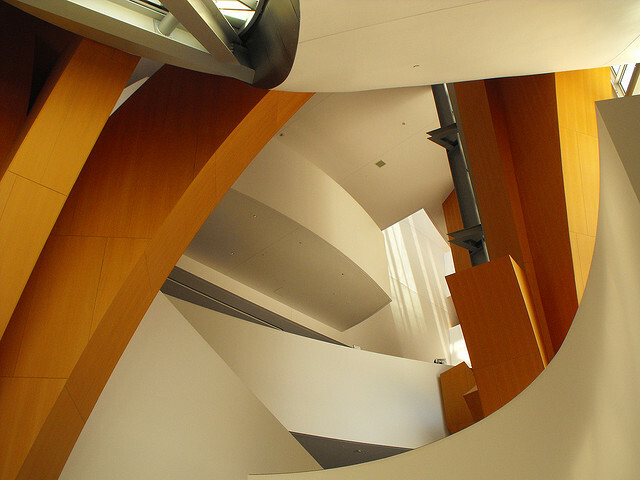 It's an enormously complicated structure because of the curved shapes and intricate joinery. The aesthetic goals with the exterior wall, all the acoustic issues, there is so much that is atypical. 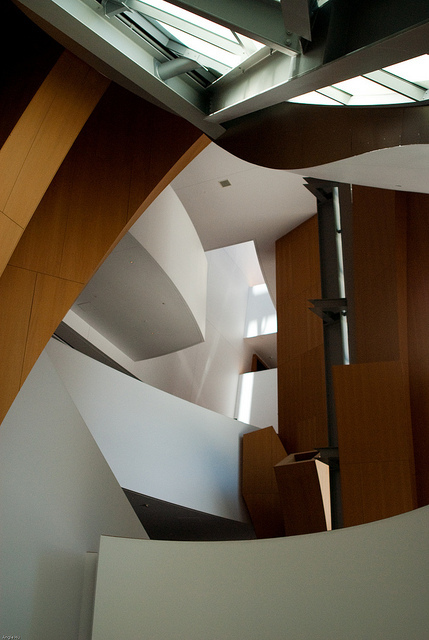 This is in no sense a conventional building." 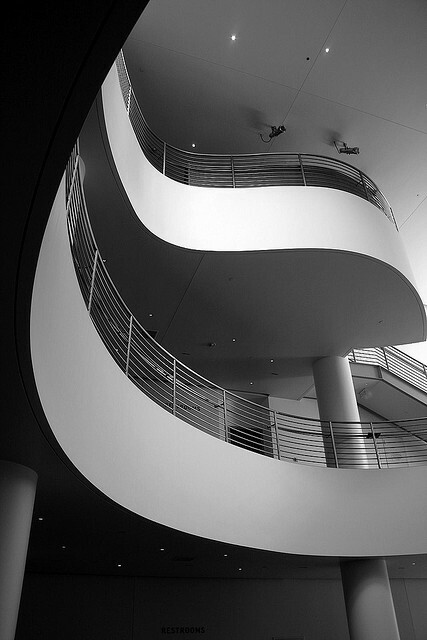 Not to be outdone by the jaw-dropping exterior the interior of the Walt Disney Concert Hall is also a masterpiece of design. 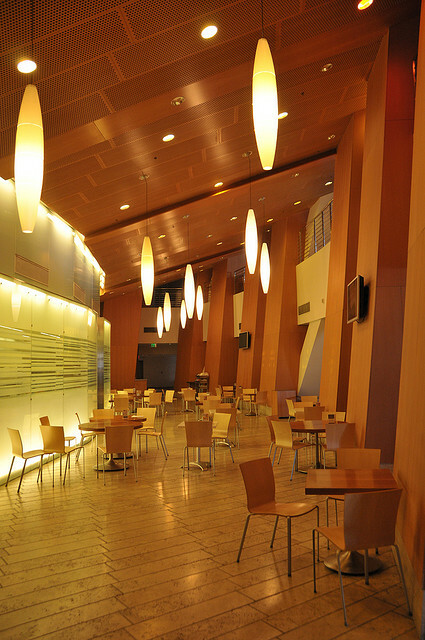 The 293,000 square-foot complex features a main auditorium with seating for 2265, a 250 seat multi-use theater, a 3,000-square-foot art gallery operated and programmed by California Institute of the Arts, the Roy and Edna Disney/CalArts Theater known as REDCAT and two outdoor auditoriums featuring a children's amphitheater for 300 and a smaller space that can accommodate 120. 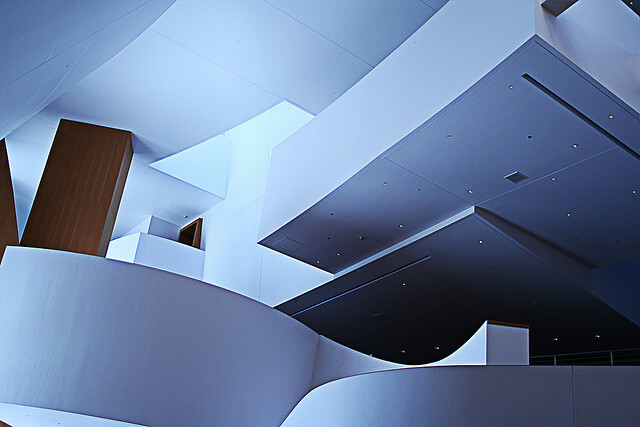 In addition to the auditoria the complex features multiple atrium lobbies, BP Hall for pre-concert events, a Founders Room, the Box Office and a Gift Shop. 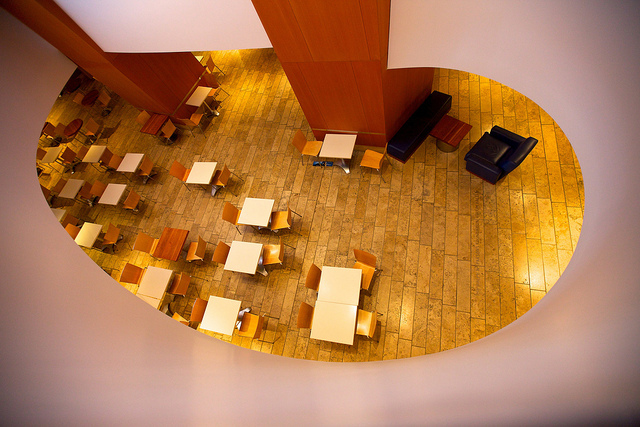 Also within the complex is celebrity chef Joachim Splichal's fine dining restaurant Patina. 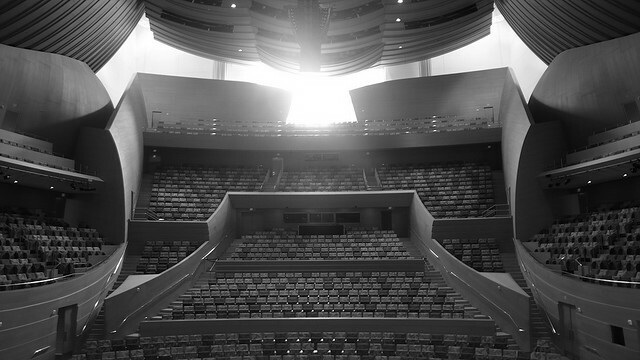 "Collaborating with [Music Director and composer] Esa-Pekka and Yasuhisa Toyota [Nagata Acoustics] on the design of the hall was an invaluable part of our work from the very beginning. 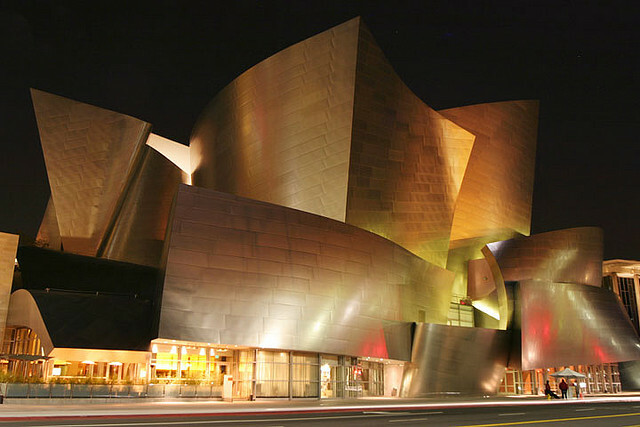 Their inspiration and vision helped us to realize what we believe will be one of the finest concert halls in the world." 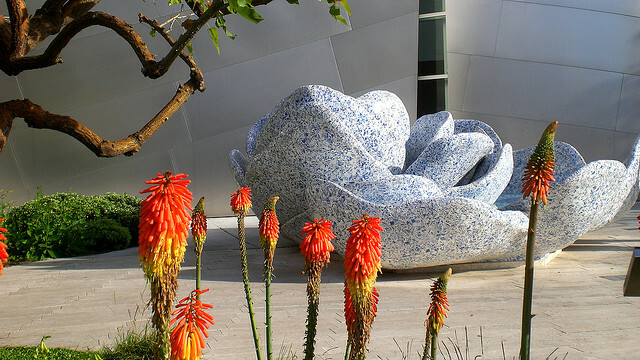 Located in one of the complexes public gardens the beautiful fountain "A Rose For Lilly" was Gehry's tribute to Lillian Disney, the initial donor to the Walt Disney Concert Hall project. 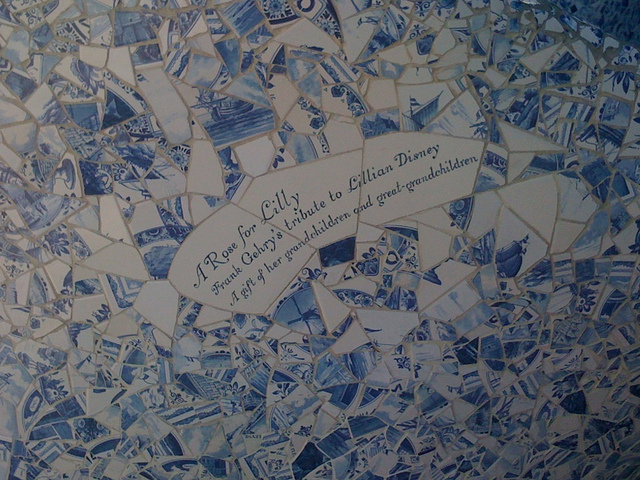 Lillian was known to love Royal Deft porcelain. 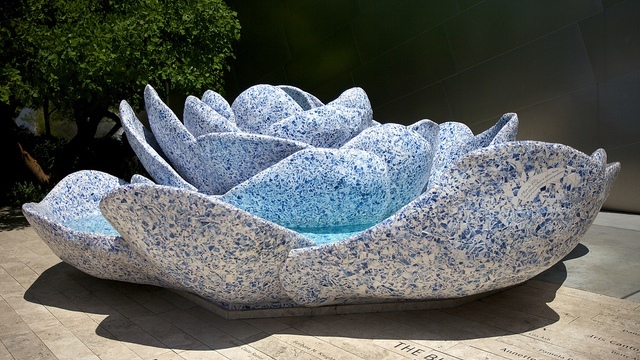 In creating their lasting tribute Gehry and his team purchased and then smashed over 200 deft vases and 8000 Deft tiles to create the mosaic that decorates the fountain. 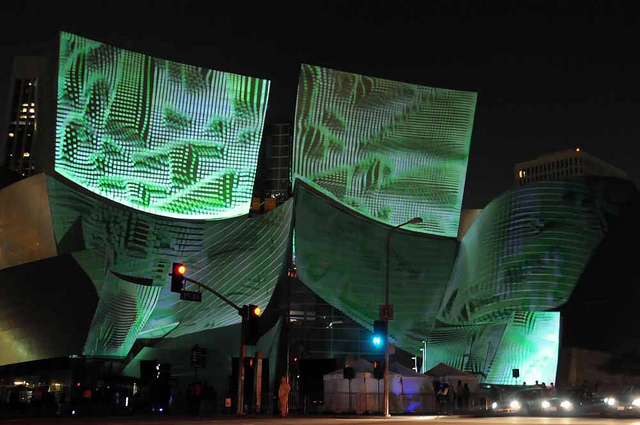 A team of 8 artists working mostly 7 days a week took around 4 months to complete the 15 ton sculpture. "A Rose For Lilly" is a wonderful tribute and seems to have stirred at least one photographer to create a spectacular photograph. When I saw the photograph above it instantly became one of my favorites; vibrant colors and a wonderful composition allied with the shapes and textures of the subject give the image an almost other-worldly appearance that for some reason puts me in mind of Salvador Dali. I think it is a stunning photograph. Of course knowing me and the odd-ball that I mostly am no-one else will see it that way but I figure most people will appreciate the quality of the image. The image was by Andy Castro and is hosted on Flickr under a creative commons license - check out a 1024x576 hi-res version here. 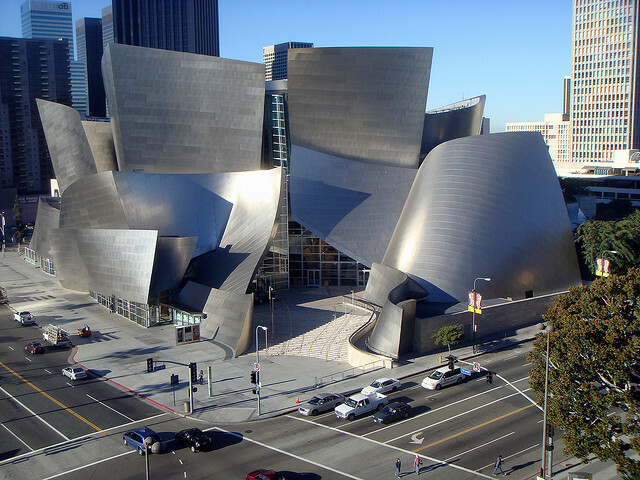 "Everyone can now hear what the L.A. Phil is supposed to sound like." 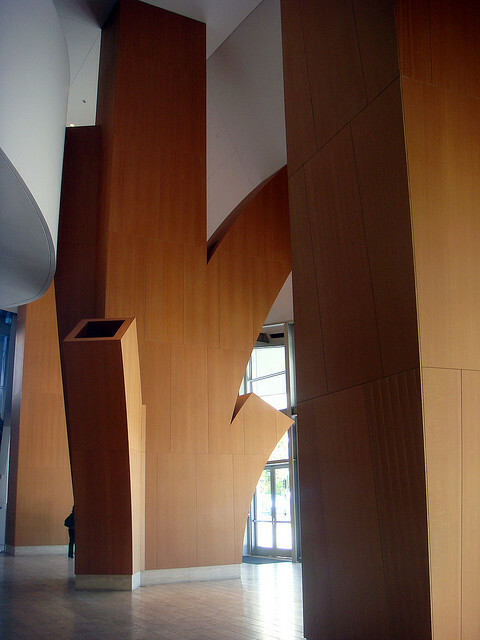 With Douglas-Fir finished walls and Oak flooring the auditorium is not only highly praised for its acoustics but also looks marvelous [though I have to confess that the soft furnishings are not to my personal taste - check out one of the interior shots below]. 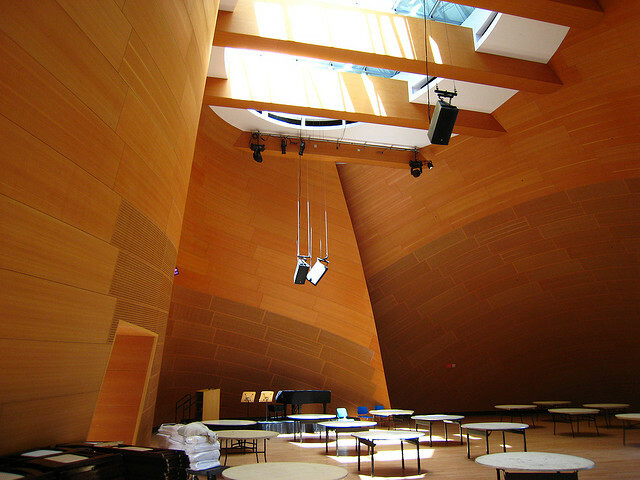 The main auditorium also features a 36-foot-high rear window and skylights [that had to be lifted to the roof by helicopter] that allow in natural light to enhance daytime concerts. 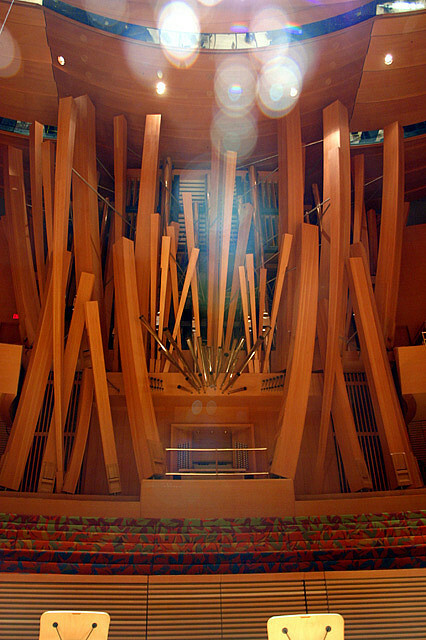 In 2004 the final feature of the main auditorium was completed, the concert organ. 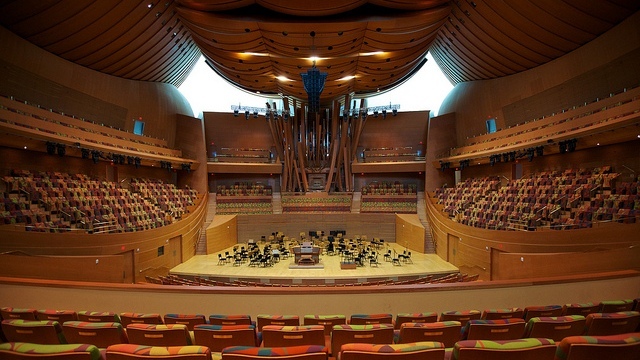 Designed by Los Angeles organ designer Manuel Rosales and Gehry the organ went through a very fluid design process. 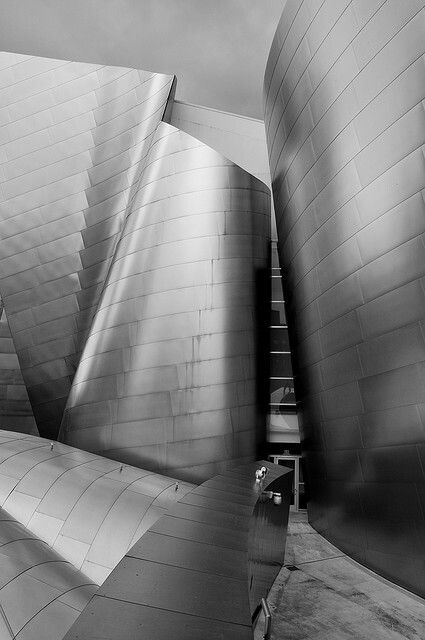 Gehry was responsible for the form and appearance of the organ with Rosales dealing with the sound design. 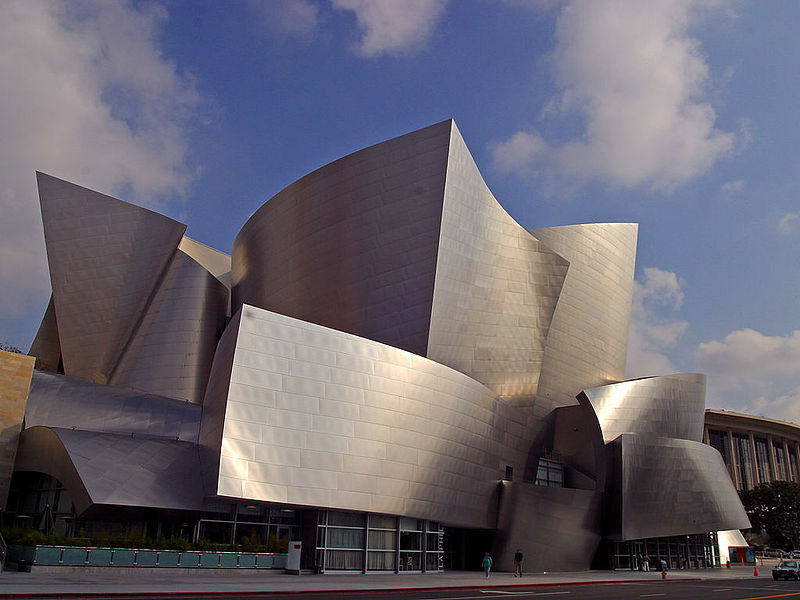 Many of the early designs proposed by Gehry were simply not musically possible but eventually Gehry came up with a viable proposal that Rosales described as being "like a logjam kind of thing turned sideways". The organ debuted in August 2004. In 2005 modifications had to be made to the exterior of the Founders Room. 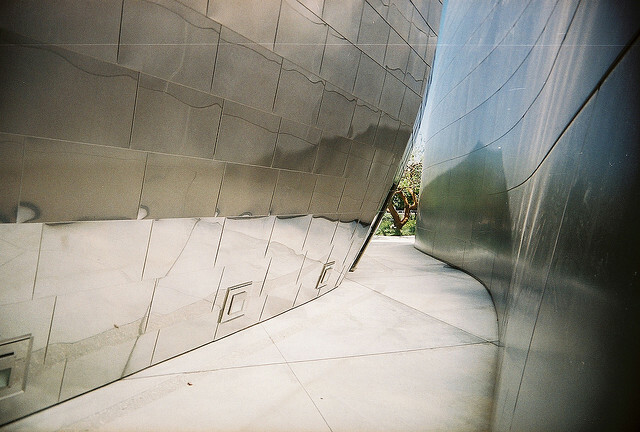 Unlike most of the exterior surfaces which had a matte finish the Founders Room exterior was highly polished. That finish together with the parabolic effect of some of the walls caused reflected sunlight to result in extremely high temperatures in some nearby condos and "hot spots" on sidewalks that reached as high as 140 °F. Following requests from local building owners and residents the polished surfaces were sanded to dull them and reduce glare. 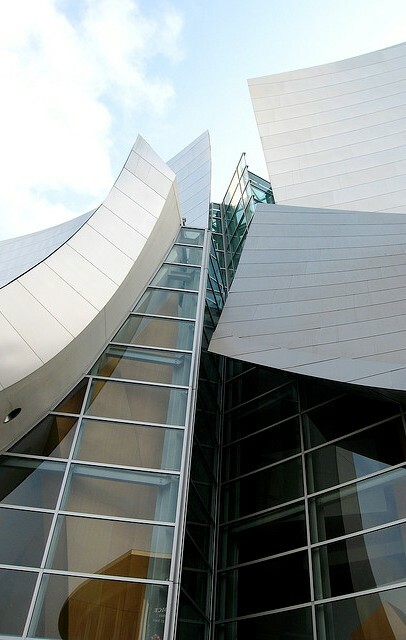 Gehry's buildings are often polarizing; his deconstructivist style is either loved or hated by most, there does not seem to be much middle ground. 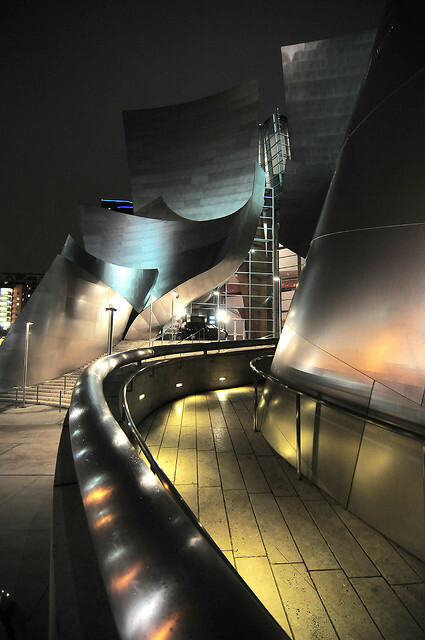 I tend to be a supporter, I find the style interesting, striking and aesthetically pleasing and judging by the amount of material out there relating to the Walt Disney Concert Hall I am not alone. The "creative commons" community on Flickr has posted a huge number of high quality images; I grabbed a few and as always provide attribution by a link to the source image but I want to give a shout out to all, there are a huge number of really great images and for those of you who want to see more than I am hosting here just follow this link. There are also quite a few videos on Youtube; I selected 4 that I thought gave a broad spectrum of what was out there. 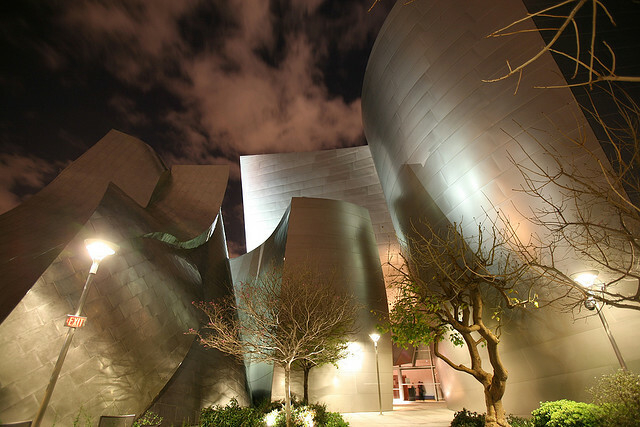 They include an interview with Gehry and tourist videos of the exterior, interior and a tour guide chatting about the concert organ and the acoustics.